“Add” means you have not created the transaction in QuickBooks Online. “Add” is to basically record the new transaction to the register in QuickBooks. “Match” means you have already created it in QuickBooks Online. You want to match the downloaded transaction to the one created to register, so it’s not duplicated. “Transfer” means you make a transfer from one bank account to another bank account (or credit card account). It’s not for entering an income or expense account to the transaction. Once it’s downloaded transactions, for each downloaded transaction, QuickBooks will analyze the bank data and gives you possible suggestions like category or payee to accept the new transaction into QuickBooks. Since the item has not been created in QuickBooks, it’s your job to review the item and make changes if necessary. When you’re satisfied with the details (payee and account category), click “Add” at the end of the row. The transaction disappears from the list (“New Transactions” tab) and moves to the “In QuickBooks” tab. Select a row. The row expands to show you more details. QuickBooks may display a customer or vendor name, as well as a category. Uncategorized expense or income appears if QuickBooks can’t find a likely category. Again, it’s still your job to review item details before adding new transactions to the register. Also, see UNDO below. When QuickBooks download bank data (via Bank Feed, WebConnect) in “New Transactions” section of the banking page, it will look for a way to find a match with any QuickBooks transactions you have already created manually. If it finds a possible match, it lists the transaction in the Recognized tab and displays the word “MATCH” in green in the row. If it finds more than one possible matches, it lists the transaction in the Recognized tab and displays the word “MATCH” in gray in the row. QuickBooks displays one possible match from existing entries, like payments from customers and purchases to vendors. In this example (screenshot below), Invoice payment to Freeman Sporting Goods for $50.00 matches a downloaded deposit transaction, QuickBooks suggests it as payment for that invoice. If you agree, click Match. The transaction disappears from the list and moves to the “In QuickBooks” tab. If more than one match is found, QuickBooks displays them as possible matches. Click to select the transaction that matches the bank item. In this example (screenshot below), you have two Squeaky Kleen Car Wash expense transactions for $19.99. You will need to select one right transaction to match. Once you agree, click Match. 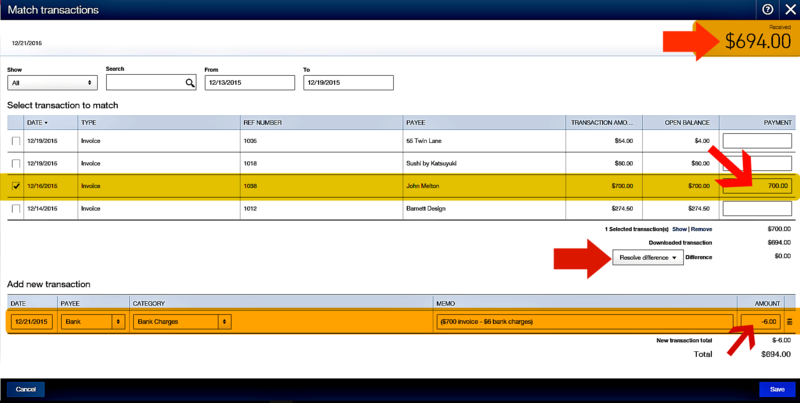 The transaction disappears from the list and moves to the “In QuickBooks” tab. If it’s not a correct match, click “Find other matching transactions” to search for a different match or to match to multiple transactions. If you found the right transaction to match, but the amounts are slightly off (due to discounts or fees, and so on), you can make an adjustment to resolve the difference. In this example (screenshots below), it was not a correct match. The $700.00 deposit was invoice payment from a different customer . Bank just took out $6.00 charges and deposited $694.00. It was shown as a possible match as a payment from a different customer. That’s why you need to review transaction before click Match. A transfer means money is being transferred from one of your accounts to another account that is both on your company chart of accounts. For instance, money is transferred from your checking account to a savings account. It can also be used when you pay a credit card from your checking account, as long as the accounts are both on your company chart of accounts. It’s basically a transfer of funds between accounts. Note: QuickBooks does not actual transfer of funds, you make the transfer and record it in QuickBooks. Click the check box for each row you want to add. To accept all the items without changes, click “Accept selected”. To assign a single payee, category, class, location, and more, click “Modify selected”. Make the changes you want in the Modify selected window and click “Apply”. To now add the modified transactions to QuickBooks, keep the check boxes selected and click “Batch actions” again. New Transactions” tab from “In QuickBooks” tab on the Banking page. “Undo” works for excluded transactions too. The steps are the same as described here, but you work from the “Excluded” tab instead. Select an account from the cards at the top of the page, and then click the “In QuickBooks” tab. Find the transaction whose action you want to undo. Click “Undo” at the right end of the row. The transaction disappears from the list and moves back to the “New Transactions” tab. Select the checkboxes for the transactions to undo at the left edge of each row. Click the “Batch actions” button at the top of the table and select “Undo”. The transactions disappear from the list and move back to the “New Transactions” tab. CAUTION: If your bank account is already reconciled, you normally do not want to undo reconciled transactions from here.